So far 2015 was a busy year, four times I have been to Ukraine, once to Romania. For the first time in my life, I feel like I have traveled too much. For months I was not able to edit the black and white photos of my journeys properly. Now I’m happy to be home and finally have time to work on the photos. Here is a selection of black and white images of the journey through Bukovina in April. Vatra Dornei is an old spa in the middle of the Carpathians. The traces of its glamourous past are still visible. This includes a magnificent synagogue. A colorful contrast is the surrounding countryside with its wild mountains. In Cârlibaba we visited a particularly poignant small Jewish cemetery. Today we traveled further west, deeper into the Carpathians. The Monastery of Voroneţ and the Jewish heritage of Vama and Câmpulung Moldovenesc were on our way. Again and we looked for the remaining traces of Jewish Bukovina, for cemeteries and synagogues. 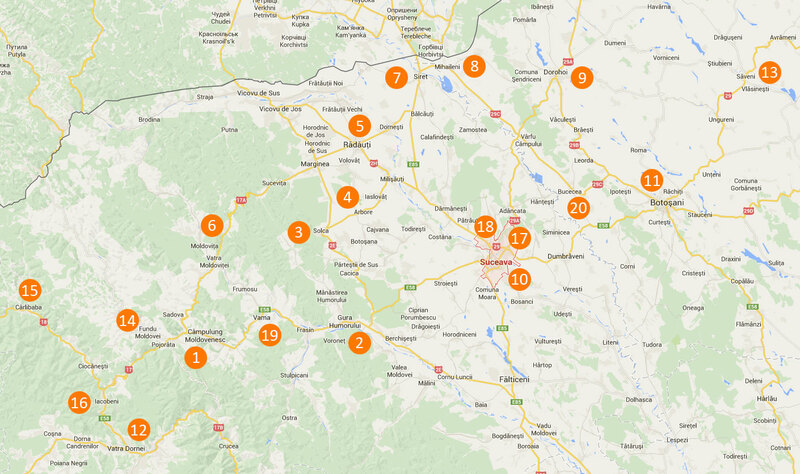 Once again, we tried to visit the New Jewish cemetery of Suceava – this time with success. Then we went on to Gura Humorului, a former shtetl in the Carpathians. A trip back into the winter and into the past. Today we have reached Bukovina. It took 7 hours until our train solved the 330 km between Cluj-Napoca and Suceava. We crossed the Carpathians from west to east. In the first half of April 2015 I will be back on the road with my friends Petra and Achim. We are an experienced travel team. Among other trips, we were traveling two years ago in Galicia and Northern Bukovina in Ukraine. This time Southern Bukovina, by now the Romanian part of the former Austro-Hungarian crown land, is waiting for us. I compiled a list of places to go, but I’m sure there are knowledgeable readers who have good suggestions for more destinations!